Tom Hiddleston has stolen almost every scene he has appeared in during his reign in the Marvel Cinematic Universe. His most villainous turn came in The Avengers, as Loki took top billing. As he stole the thunder from everyone around him following the films incredible success, we now get a glimpse at just how giddy the actor was to be playing the role. 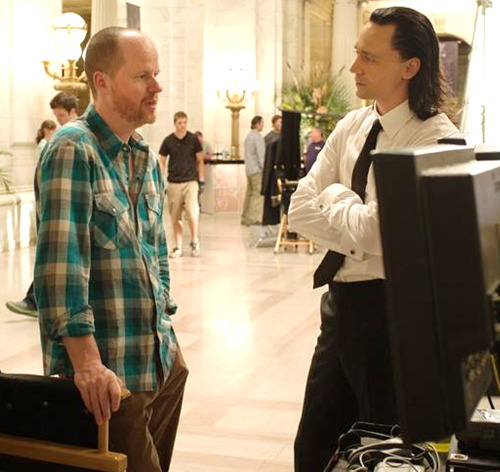 Hiddleston sent director/writer Joss Whedon an email directly following his first read through of the script and thanks to The Chicago review press and the business insider we have it in all its fanboyish glory. I would love to gush more over how amazing this letter is but I will just let you read it as the thespian refers to his character as Hans Gruber with super-magic powers as played by James Mason. ... Thank you for writing me my Hans Gruber. But a Hans Gruber with super-magic powers. As played by James Mason ... It's high operatic villainy alongside detached throwaway tongue-in-cheek; plus the "real menace" and his closely guarded suitcase of pain. It's grand and epic and majestic and poetic and lyrical and wicked and rich and badass and might possibly be the most gloriously fun part I've ever stared down the barrel of playing. It is just so juicy. I love how throughout you continue to put Loki on some kind of pedestal of regal magnificence and then consistently tear him down. He gets battered, punched, blasted, side-swiped, roared at, sent tumbling on his back, and every time he gets back up smiling, wickedly, never for a second losing his eloquence, style, wit, self-aggrandisement or grandeur, and you never send him up or deny him his real intelligence.... That he loves to make an entrance; that he has a taste for the grand gesture, the big speech, the spectacle. I might be biased, but I do feel as though you have written me the coolest part. ... But really I'm just sending you a transatlantic shout-out and fist-bump, things that traditionally British actors probably don't do. It's epic. The letter appears in a new biography about Whedon entitled Joss Whedon: The Biography by Amy Pascale which came out today. By 2012e5b9b47e69c8820e697a5 - 1:13 PMI have been trying to acces this site for a while. I was using IE7 then when I tried Firefox, it wkored simply fine? just wanted to bring this to your attention. This is in actuality a excellent site. I have a bunch myself. I actually love your layout. I recognize this is off topic but,did you yield this site yourself,or buy from somewhere.